Gorilla Coffee, originally uploaded by buendiaproductions. Not to worry anti-gentrifiers, and sorry to break it to you coffee-shop-desirers, it's where they roast the coffee. 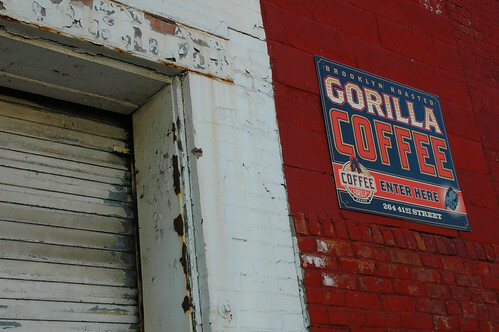 Where you drink the Gorilla coffee is far to the north. Thanks for Buendiaproductions for uploading this photo to the Best View in Brooklyn photo pool on flickr.com. Check out his website for some fantastic posts and photos about Sunset Park.